Waking up around 1 p.m.
Bowl of Honey Bunches of Oats with Milk. Dropping my car off at a body shop. I get picked up by an Enterprise agent driving a Mini Cooper. Me: "Oh! I've never ridden in a Cooper before." The girl and I spark up conversation. She graduated from Ocean Lakes high school in '07. Me: "Me too except I'm class of '02. I'm an oldie." I'm given a silver Kia Soul for my rental, free of charge of course via the insurance company. Watching a documentary on The Prohibition. Eating leftover Tilapia with Garlic, Onions, Peppers, Mushrooms, Carrots, and Quinoa-Brown Rice Mix. Ana comes over. Ordering a large Cheese Pizza from Chanello's. Sitting out in the parking lot eating slice after slice – taking advantage of my rental car's Sirius satellite radio and listening to the 70's station. In Josh's bedroom with Leisa, Laron, Kevin, Richie, and Ana sharing music and Werner Herzog oddities on Youtube. Sophie runs around with the squeaky tennis ball acting bashful and playful. Richie continues painting his mural on the wall. Ana scrammed away on her bike. I figure out what she's doing and join her on mine. We ride around the neighborhood across the street. Snagging a bunch of bagels from the dumpster on the way back. In my room I switch all the lights off except for the blue string lights coiled around my bed and glow from the computer screen. With lounge-like electronic music in the background my hopes are to instigate sensuality between Ana and I. It's been a while to which we are both aware. Typically she keeps her distance in regards to sexual desires unless I bring it to light. But we both make the moves and a lengthy session inspires a new position that we both find pleasurable. Afterwards, lying down. 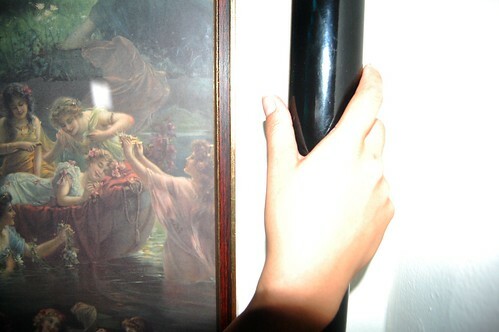 She squeezes in between the wall and bed right next to the neoclassical picture of women dancing in the woods. The song "Time" by Blonds is playing on the laptop. I go on a mini thought tangent about how odd it would be if someone from a hundred years ago were to hear this song a hundred years from their time. I get up and joke around, "Hey girl! You lookin' for a man? You need someone strong?" Her: "I feel like that's said to me at least three times a week. I just laugh it off and walk away." Sleep together around 4 a.m.
[i] Ana with the ladies in the jungle. Image by me.